It's not new, that the main purpose of each gambling game is money. Money really has powers in the world, making people the obeying slaves, who will do everything in order to get it. Every player may think: "what will happen if I put one dollar more? ", and this desire to receive the payouts, to reach financial satisfaction, fills him/her from head to foot. It is one of the most horrible sins that a person can do. But even not paying attention to the religious side of the signification, greed is just the state, when a person desires to take somebody's property. Person takes others' possession, which doesn't belong to him, and just seeks for the opportunity to avoid returning some compensation. This is called covetousness, and this is what gambling exactly involves. Even if somebody tells you, that gamblers are ready to pay up for the games, the main idea that chases them is to have some kind of freebie. There is no spirit of a good will, with which players give money away in order to gamble. There is mutual greed, like in a dueling, where you will find the mutual attempts to murder: the persons agree to give the opportunity to be killed by each other. But such agreement, both in gambling and in dueling, just turns the participants into the sinners. A lot of players will say: "What are you talking about? I'm just playing an innocent game without any purposes." But it's not right, and it's really not about excitement or thrill, all gambling is done for money. If they really don't care about it, then let's take money away from the game! And it'll be only for fun. But nobody will ever do it, and the point isn't about heat, it's about our money insatiability, it's really about greed. 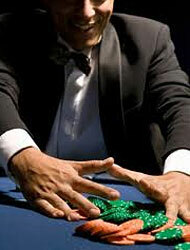 A problem gambling rises, when a player starts negotiating with the game. For example, the manufacturers of chocolate have put sugar there which someone likes and has been longing for. In the same way, the games are filled up with money, which we crave for. It often happens so, that the losses of a particular gambler make him come back to the machine and return his/her money back. Here, we'll notice no free will to gamble, a player is forced to continue gambling, not realizing the fact that he/she is unlikely to win. Approximately 78% of gamblers really don't mind the bets; they are surrounded by the money significance. It's considered that this greed is the main aspect of addiction identification. If we cross money out of the game, it'll become honest and for real fun. The new world of playing will be opened for the gamblers, as soon as they manage to do it. There won't be any losses, any winnings, and you'll have control over yourself and just the gambling process. Just try!